Nutshell Notes - "Teaching Tips in a Nutshell"
"Nutshell Notes" was created by Dr. Edward Nuhfer in 1991, with numbered issues begun in 1992. Volume 6 Number 6 is the Homepage for Boot Camp for Profs®. It is updated annually. Sorry! We are filled for 2009, and registration has closed. Welcome! As director of Boot Camp for Profs®, I have a separate life as Director of Faculty Development at California State University of the Channel Islands. Every other instructor at Boot Camp--faculty developers, authors, professors—also have separate professional lives, all centered around service to faculty and teaching and learning. Once each year, we come together for this very special week. Boot Camp for Profs® is an independent program, although its accounting has at times been run through several universities. To better reflect ownership of the program, our Boot Camp Homepage has been hosted on this private server since 2006 rather than on a university server. The first Boot Camp was founded in 1993 by a number of us who were at University of Colorado at Denver, and it drew over 80 participants from all over the U.S. and several foreign countries. In subsequent years we broadened our base of instructors from local to regional, and we held successful programs at many locations. We instructors also decided we wanted to run a small camp and not make this into any institution's "cash cow"—we try to keep registration at around twenty participants and costs as low as possible. We discovered the Timberline Campus of Colorado Mountain Colleges about ten years ago, and have never found a better site. The facilities are perfect, the staff is very professional and knows our needs and even the diet preferences of professors. We now consider Leadville our "home" for the program. The content and we instructors (hopefully!) improve a bit each year. At the end of this week-long program, we don't want to leave—neither will you. We expect the event for 2009 to be better than ever. For all questions or information, contact the director at enuhfer@earthlink.net or by personal cell phone at 208 241-5029. "BOOT CAMP for PROFS®" is a unique week-long program dedicated to celebrating and enhancing college teaching. This event, set in one of the most beautiful areas of the Rocky Mountains, is one of growth and renewal. It is attended by professors at every career stage and from every conceivable kind of institution.The program has achieved outstanding reviews from attendants, be they new professors looking to begin their faculty careers or established professors seeking to strengthen skills and renew enthusiasm. Over the fourteen years that it has existed, the most common response from attendants is "life-changing." The original Boot Camp started in 1993 as a solution to an serious problem: "How can teaching skills truly be enhanced, given existing faculty commitments of time during the normal, busy school term?" The early Boot Camps began as a special summer week when faculty could concentrate solely on university - level teaching and career survival skills. The week provided a series of workshops that were based upon producing products for one's own courses. In some years, we ran two to four camps. The early camps now seem primitive compared with what we do now. The Boot Camp has evolved from a series of excellent but loosely connected workshops to a coordinated program of development designed with central unification to produce an effective higher education professional. Boot Camp in its middle years increasingly concentrated on the concept of one's personal "teaching system" in the context of what fits best for each of us and for our careers within our specific institutions. A "teaching system" addresses practice by building upon a few central, unifying concepts. These concepts are developed and expressed within a document that can be considered as a blueprint for practice—a "teaching philosophy." This document addresses: (1) our core aspirations and values that we become aware of through self introspection in which we reflect on our personal growth, satisfaction and professional improvement; (2) content learning outcomes we want for students; (3) teaching in the forms of making informed choices about pedagogical approaches that match our learning outcomes and will produce the best kinds of experiences to help students to learn; (4) thinking in terms of addressing the most appropriate stages of intellectual and ethical development; (5) rubrics that will insure that high level challenges of critical thinking will be met by high level responses from students and (6) student self assessment, about their learning and their learning process, which is the correlative to our own introspection. Over time, we found that this integrated approach was more effective in producing permanent career success than were any series of workshops. In recent years, we took this approach one step farther to stress how these six areas can take one beyond individual success to build strong curricula through unit-level development. We began to realize that no matter how good a single teacher may be, no matter how many accolades from students or how many teaching awards one individual might have, students don't become educated in one course nor from one professor. High level thinking, as a particular outcome, is not produced in any sixteen-week course alone. Literature shows that an effort needs to be sustained across several semesters to produce such thinking, and that departments or institutions that want to get this result need to produce curricula that sustain planned efforts over a required time. This leads to recognition that the most effective "teaching system" is not simply an individual development effort to improve courses and student ratings. Rather it results from individuals' efforts informed by research, made with awareness of responsibilities to an effort larger than oneself. This requires planning and colleagues' working together. Thus, when we teach with well-constructed lessons and well-planned courses, we must keep in mind that one educates best when one aligns such efforts with a planned larger vision. One has to be aware of particularly aware of efforts and effects at different scales that range from the individual lesson to the institutional degree. The patterns seen within educational institutions and the patterns of events in time that occur in the process of becoming educated that best seem to depict effective use of teaching systems are fractal patterns. 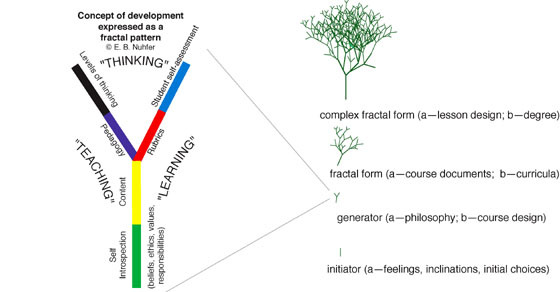 The Boot Camp program thus evolved through over a decade to its present form with an emphasis described in recent years by "Educating in Fractal Patterns." The utility of fractals to explain many phenomena in higher education has been described in about twenty columns in "National Teaching and Learning Forum" and in a 2007 paper in POD's peer reviewed journal, "To Improve the Academy." To date, the fractal form has proven to be a strong unifying model for design and practice. Fractals constitute the geometry of most natural forms (including neural networks in the brain that form during learning), and patterns of events in time of many natural phenomena. Such forms appear complex and maybe even random, until one realizes that these forms are constructed from recursive constructions of a simple form called a generator. Because the brain is a fractal neural network, our actions, our products of mind—what our brain does—can be expected to have fractal qualities. By recognizing the nature of fractals, we can understand how to better succeed in what at first appear to be immensely complex endeavors. For example, if one looks at a tree in winter, it at first looks complex, and intimidatingly difficult to describe in any quantitative or concrete terms, until one recognizes that the branching pattern results from a recursive construction from a simple "Y" shape. An example of a recursive operation another is to replace each of the upper two branching lines in the "Y" with another "Y." Soon, a very complex branching pattern is built from the recursive assemblage of "Y" shapes. Being able to perceive the "Y" generator suddenly brings order to what appears to be an extremely complex form. Teaching too is a complex activity. But, like the tree, it has order and is not "random." If a teacher can operate from a mental generator that isn't deficient, then the resulting product of educated students with high level thinking abilities is much akin to the product of a healthy tree arising from repeated branching forms. The "generator" of an individual teacher can be made visible in a teaching philosophy. Such a philosophy is a blueprint to practice that accommodates one's individual aspirations and ineffable spirit. It becomes a strong and sophisticated philosophy only when built with the best knowledge available about one's content area, about teaching practices that best serve adult learners, about the nature of learning, and about mentoring students toward higher levels of thinking. Once the essence of teaching, learning and thinking in the context of one's aspirations is informed and clear, the kinds of course products and educational experiences that are effective and contribute strongly to a larger effort begin to emerge in practice. Success results from practice of our philosophy and communication that clearly conveys to students and peer reviewers specifics about the choices we have made. With a fractal system, assessment, the sometimes maligned "A-word," is never an added-on summative chore. If a sophisticated teaching philosophy is a road map to practice, assessment is the necessary consultation with that map to insure that we can answer: "Where are we now? Where do we need to go next?" Assessment is simply monitoring of practice that insures all participants accomplish what they set out to do. In analogy to the figure above, assessment helps assure that the "tree" grows into the desired form rather than leaving the form to build from random chance. Assessment permits disparate aspects of practice to thrive together but to nevertheless produce the desired results. Instead of merely drafting documents such as syllabi, tests, or supplementary materials based on prescriptive methods, we draft such documents based upon our core philosophy. When one has true alignment, then a student or a peer will know your core teaching philosophy from reading your syllabus or your tests. Consistent alignment of your efforts to do what you most want to do enables students to achieve what you most want them to achieve. When faculty are not satisfied with student outcomes, either with respect to learning or to students evaluation of satisfaction with the course experience, it is surprising how often this occurs because faculty are not actually doing what they most want to do. There is no universal "best" teaching system, but there is a best system for you—namely the system that most effectively helps you and your program to achieve the outcomes that you desire and that matches what your program has promised to students to address those particular students' needs. Discovering your personal system, and how that fits into some larger educational picture is much of what "Boot Camp" is about. The extremely supportive environment present in this program helps in this discovery. Outcomes of this program speak for themselves. Some attendants in "career terminating situations" later find themselves in the situation of recipients of best teaching awards. Others have founded faculty development centers at their own campuses. The "Camp" is small. We prefer to work with a group of about twenty faculty. Other distinguishing characteristics for "Boot camp 2009" include: (1) workshops that result in attendants preparing actual materials for their own classes on - site, (2) receipt of a personal library of acclaimed resource books and (3) an emphasis on how to become increasingly successful in each passing future year. In addition to teaching, emphasis is also given to more rarely considered aspects of career success such as becoming a better colleague and becoming a better advisor for students. The camp experience will introduce you to a body of literature that is seldom encountered within academic disciplines. It is immensely useful, and familiarity with it is gradually becoming indispensable to success in today's universities. Materials you will receive in the 2007 "BOOT CAMP for PROFS®" include a very thick and useful set of working notes plus nine books—likely those below. Sections of these will be used during the week, and they will serve you for many years as good reference sources. If you were to found your own office of faculty development, these would constitute a solid set of resources. *Bain, K., 2004, What the Best College Teachers Do: Cambridge, MA, Harvard University Press, 207 p.
Cooper, J. L., Robinson, P. & Ball, D. (Eds), 2003, Small Group Instruction in Higher Education: Lessons from the Past, Visions of the Future: Stillwater, OK: New Forums Press. Davis, Barbara, 2009, Tools for Teaching (2nd ed. ): San Francisco, Jossey - Bass. Fink, Dee, 2003, Creating Significant Learning Experiences: An Integrated Approach to Designing College Courses San Francisco, Jossey - Bass. Gray, Tara, 2005, Publish and Flourish - Become a Prolific Scholar: New Mexico State University Academy Press, 174 p.
*Jones, Thomas B., 2005, The Missing Professor: Sterling, VA, Stylus, 144 p. King, P. M., and Kitchener, K. S., 1994, Developing Reflective Judgment: San Francisco, Jossey - Bass, 323 p.
*Leamnson, R., 1999, Thinking About Teaching and Learning - Developing Habits of Learning With First Year College and University Students: Sterling, VA, Stylus, 169p. Loacker, G (ed. )., 2000, Self Assessment at Alverno College: Milwaukee, WI, Alverno College, 162 p.
Nuhfer, E. B., and others, 2006, A Handbook for Student Management Teams: Camarillo, CA, California State University of the Channel Islands, 60 p.Stevens, D. D., and Levi, A. J., 2005, Introduction to Rubrics: Sterling, VA: Stylus, 169p. *Zander, R. S., and Zander, B., 2000, The Art of Possibility: Transforming Professional and Personal Life: Harvard Business School Press, 210 p.
Zull, J. E., 2002, The Art of Changing the Brain: Sterling, VA. Stylus, 169p. THINGS TO BRING TO "CAMP"
The surest way to exhaust attendants in an extensive experience and to prevent needed reflection and thought is to schedule every moment of attendants' time right into the night. At Boot Camp, we build in free time from lunch until 2:00 - 2:30 in the afternoon on all full workdays, and evenings are free other than for one optional workshop (Tuesday evening contains the optional session on Writing and the Scholarship of Teaching and Learning) when attendance is truly voluntary. Most attendants value use of this time to network with attendants from other universities, and to draft products for their own classes based on the workshops. To be able to use this free time to its best, bring texts, notes or syllabi that you would likely employ in one (1) upcoming course. Also, bring quizzes, review questions, mid term and final exams you may have constructed for this course. Bring some of your class notes and, particularly, syllabi and drafts of your teaching philosophy on a computer or flash drive You will have access to computers at Colorado Mountain College (CMC), but it will be very helpful to have your own laptop. The dorm rooms have ethernet connections. Try to remember to bring your own ethernet cable. Alternately, you can place files online in your own e-mail sent to yourself as attachments and you can retrieve these at Leadville through CMC's computers. Because this is a golden opportunity to produce some excellent class materials, consider the course that you think will be most difficult to teach next term. You can expect to prepare a portfolio at camp that will include (a) a revised teaching philosophy, (b) a revised syllabus, (c) a knowledge survey for your course, and (d) class lessons constructed to take advantage of newly acquired skills and knowledge for your own courses. (1) Five copies of a one - page (maximum!) teaching philosophy that includes at least a summary of your teaching goals, as they exist today. Two of these copies should be printed without your name or that of your institution on it. You can consider these as preliminary because we will refine this document throughout the week. You will receive a file online after you register which will help to guide you in the initial introspection needed to begin to produce a sophisticated philosophy. (2) Two copies of a course syllabus from any course that you teach or aspire to teach. (3) Completed self reflection exercise. Part of this self reflection will involve doing a Teaching Goals Inventory for one of your courses and printing out your results; visiting the ILS questionnaire found through the web pages of Dr. Richard Felder at http://www.ncsu.edu/felder-public/ILSpage.html and getting a diagnosis of your own learning style (print it out) and finally viewing of "A Private Universe" so you will know what it is when we refer to that during camp. All attendants should have received a copy of four different books a couple of weeks prior to the Boot Camp. These are used in the Friday morning book discussion groups. When packing, it is easy to forget to bring these, so here is a reminder to pack those with you. Dress is very informal - summer recreational wear works very well for this entire week. The $1250 fee includes the workshops, materials, lodging, and all meals but one. Materials furnished include texts, bound notes, on - site Xeroxing and computer disks. Meals include breakfast/brunches and lunches Sunday - through - Saturday, a get - acquainted barbecue Sunday evening, and a banquet on the final Friday evening. Not included are Wednesday's supper (on your own) and the cost of Wednesday afternoon's recreational activity that you choose such as white water rafting or horseback riding. For those paying by check, or those whose institutions are paying by check: Make those checks out to Boot Camp for Profs® and send them to attention Ed Nuhfer, 150 Cathedral Cove Unit 33, Camarillo, CA 93012. For those paying by credit card--personal or institutional(see note below): DO NOT email your Credit Card Number. Instead, use either a PayPal® account or phone your card to Edward Nuhfer at 208 241 5029. If your institution is paying for your registration for individuals or teams from your campus, provide the information in this web page to the persons responsible for handling that paperwork. They can choose to pay out of this fiscal year's money before June 30 or pay after camp out of next year's after July 1. We do ask this year that arrangements for all payments be clarified by June 15. We will have no facilities at Leadville at the Boot Camp itself through which to process credit cards. All activities will take place at Colorado Mountain Colleges' Timberline Campus on 901 South Highway 24 in Leadville, Colorado. Housing is in the new dormitories at this campus. Each attendant has his/her own room and bathroom. Attendants may drive to Leadville via Interstate 70 and exit on either Highway 24 (Exit 171) or Highway 91 (Exit 195). The closest airport is Denver International Airport, which is about 135 miles (three hours driving time) from Leadville. Weekly rates on rental cars in summer are good, and probably provide the most economical connection from Denver to Leadville. The schedule for Camp follows below on these web pages. Leadville is at an elevation of a bit above 10,000 ft with cool evenings and warm sun during days. For those engaging in white water rafting (a mid - week option) bring clothing that can (1) be doused with water without care and (2) can offer protection from excessive sun exposure. Those engaging in horseback riding (also a mid - week option) should bring long pants such a blue jeans. The area around Leadville has wonderful hiking trails and scenic biking. A newly completed bike trail lies adjacent to the campus. If you drive to the camp, vring a bicycle. The town hosts a mining museum, an antique train that carries one to incredible vistas near Climax, and other recreational attractions. Because Leadville sits at an altitude above 10,000 feet, a few tips on dealing with the altitude will be useful to those coming from out-of-state. Common inconveniences of acclimating to this altitude include difficulty sleeping and headaches for the first day or so. Drink plenty of water, because these effects usually are exacerbated by dehydration. The air is cool and thin, so you won't feel the usual heat accompanied by dehydration. Sunburns occur easily at this altitude for the same reason. Use sunscreen or dress in long sleeves when spending a lot of time outdoors. For those who use Wednesday afternoon to go whitewater rafting, consider sunscreen as a "must." Starting on Monday morning through Friday, participants should have the option to attend morning yoga classes. We are still negotiating this. July 11, Saturday - dorms open for evening arrivals as needed. Call 208 241 5029 for very late arrival. Camp Director will meet you at the door at whatever hour you arrive. BREAKFAST 8:00 - 9:00 A.M.
(c) Your completed introspection exercises - click here. This session integrates "The Teacher in the Movies" presentation by James Rhem, which has been performed as conference keynotes and campus presentations all over the country with workshops "Harnessing the Power of the Affective Domain in the Classroom" and "Educating in Fractal Patterns" likewise delivered by our other instructors into an extended interactive discussion with participants. 3:30 – 4:40 Mystery Theatre—Opening Act with Tom Jones. Bring with you The Missing Professor This session opens additional book discussion options with the author as "Chapter dujour" at selected meals at a designated table. This session shows the uses of assessment and evaluation tools including knowledge surveys, rubrics, focus groups, student management teams, student ratings forms and the essentials of testing, grading and being graded. Afternoon - Evening RECREATION Options - Horseback riding, biking, hiking white water rafting, are a few of many possible options. You may want to use this for your own personal R & R break - your free choice! Costs of recreational events are borne out - of - pocket by participants, and rates for each option will be furnished on opening day of camp. Dinner - out on your own in Leadville or elsewhere, possibly with your recreational group, but again, your personal option. July 16, Thursday – The Thought Day - LOTSA STINKIN' THINKIN'! Noon - 1:00 Lunch Break Join your "syllabus buddy." 10:50 - noon – Three Book Discussion Groups - your choice of Leamnson, R., 1999, Thinking About Teaching and Learning or Bain, K., 2004, What the Best College Teachers Do, or Zander and Zander, 2002 The Art of Possibility. 6:30 BANQUET - BOOT CAMP CELEBRATION! - Please Inform us whether you are leaving for home at the end of the banquet or if you are staying overnight in the dorms. Most adjourn to town for one final party after the banquet. July 18, Saturday  No sessions or meals- campus closes down. Campers staying Friday night may wish to gather for final goodbyes at a breakfast spot of choice in Leadville before heading home. Checks are preferred. However, if your institution insists on use of a credit card, provide the folowing information by phone to 208 241 5029. Lodging at Leadville will be in Colorado Mountain College dormitories and includes towels and linens. We give attendants their own room and do not "double up." Each dorm room has two small single beds standard, and CMC can create four bunk beds in a room. Family is welcome at BOOT CAMP. There are plenty of recreational opportunities for spouses in the nearby area, but no childcare is provided as part of the camp package and children are not allowed in the sessions. For those who bring a spouse or guest, the additional dorm and meal cost for each person is $38.00/night/person lodging and $35.00/day/person meals (breakfast, lunch dinner). Bills will be provided for guests after the end of camp. SESSIONS BEGIN PROMPTLY AT SUNDAY, 9:30 A.M. Attendants driving up from the Denver Airport or from elsewhere in Colorado may choose to arrive Sunday Morning. If you drive to arrive Sunday morning, PLEASE DO NOT BE LATE. The initial session is quite important. If you drive to campus and arrive near 9:30 a.m., go directly to the classroom in the Learning Center. That is easy to spot; it is the only building on campus that looks like the hoist house of a mine. Dorms open for us on Saturday. Most will arrive Saturday and stay Saturday night. 2009 BOOT CAMP INSTRUCTORS AND FACILITATORS include faculty and faculty developers from diverse institutions (U. S. Air Force Academy, California State University — Channel Islands, University of Colorado at Denver, New Mexico State University, University of Texas at San Antonio), the author of the acclaimed The Missing Professor, and the Editor & Founder of "National Teaching and Learning Forum," which is a uniquely progressive established publication frequently cited in primary literature. Instructors are selected based on success in their disciplines as teachers and scholars, and their personal passion and dedication to the support of college teachers. The instructors are veterans of having done the program together for years, and the effects of this will be obvious to attendants. When not in the role of managers of a session, they are participants with every other attendant. STEVEN FLEISHER is a Lecturer in the Psychology Program at California State University, Channel Islands. In his first life, he worked as a roofer and carpenter, and returning to school in 1988, completed his Bachelors and Masters in Counseling at California State University, Los Angeles. Following his loves in psychology and teaching, Steve enrolled in the Ph.D. Program in Education at UC Riverside, and is published with the Council of Chief State School Officers on standards and assessment, and the California Council on Science and Technology on education and industry. He then completed the Ph.D. in Clinical Psychology at California Graduate Institute, Los Angeles, formalizing his research in psychology and education. Steve’s research on self-regulation in academic learning is published in several issues of “Academic Exchange Quarterly” and recently with “National Teaching and Learning Forum." He also serves as the director of research for Power Teachers of America. TARA GRAY serves as associate professor of criminal justice and as the first director of the Teaching Academy at New Mexico State University (NMSU). The Teaching Academy provides NMSU educators with training, mentoring, and networking. Tara was educated at the United States Naval Academy, Southwestern College in Kansas and Oklahoma State, where she earned her Ph.D. in economics by asking, “Do prisons pay?” She taught economics at Denison University before joining the Department of Criminal Justice at NMSU. She has published three books, including her most recent, Publish and Flourish: Become a Prolific Scholar. She has been honored at NMSU and nationally with seven awards for teaching or service. Tara has presented faculty development workshops to 5,000 participants in more than twenty of the United States, and in Mexico, Guatemala, Thailand, and Saudi Arabia. Workshop participants report that she is “spirited, entertaining, and informative—she’s anything but gray! MITCH HANDELSMAN received his B.A. from Haverford College and his M.A. and Ph.D. from the University of Kansas. He has been on the faculty at the University of Colorado Denver since 1982, and is currently Professor of Psychology and a CU President's Teaching Scholar. He served for a year (1989-1990) in Washington DC as an APA Congressional Science Fellow. In 2003-2004 he was president of the Rocky Mountain Psychological Association. He is a licensed psychologist and a Fellow of the American Psychological Association. THOMAS JONES received his B.A. (1964) from the University of Minnesota and received a Woodrow Wilson Fellowship for graduate study in history. He completed his Ph.D. from Cornell University in 1968. He has taught at Northern Illinois University, Metropolitan State University (St. Paul-Minneapolis), Rockhurst University, and Maple Woods Community College. His publications include articles on American foreign policy, economic history, segregation, film and history, the humanities, college teaching, and adult education. He helped found and direct teaching centers at Metropolitan State and Rockhurst University. He is co-author of Promoting Active Learning: Strategies for the College Classroom (1993). BARBARA MILLIS, Director of the Teaching and Learning Center (TLC) at the University of Texas at San Antonio, received her Ph.D. in English literature from Florida State University. She previously directed Faculty Development at the University of Nevada, Reno and the United States Air Force Academy. She has offered workshops at many professional conferences (Teaching Professor Conference, Lilly Teaching Conferences, Association of American Colleges and Universities, Council of Independent Colleges, etc.) and at hundreds of colleges and universities. She publishes articles on a variety of faculty development topics such as cooperative learning, peer classroom observations the teaching portfolio, microteaching, syllabus construction, classroom assessment/research, critical thinking, writing for publication, focus groups, writing across the curriculum, academic games, and course redesign. She is the co-author of three books: (1) with Philip Cottell, Cooperative Learning for Higher Education Faculty (1998); (2) Using Simulations to Enhance Learning in Higher Education (2002), co-authored with John Hertel; (3) a revision of Judith Grunert’s The Course Syllabus: A Learning-Centered Approach (2008), co-authored with Margaret Cohen. ROBERT NOYD is Director of Faculty Development and an Associate Professor of Biology at the U.S. Air Force Academy. He graduated from Central Connecticut State College in 1978 with a BS in biology and a 7-12 teacher certification in science education. Bob taught a wide variety of high school science courses from 1978-1985. He was an editor for DC Heath, where he developed textbooks and ancillaries for middle and high school biology programs for the national market. Bob has taught 15 different courses at the community college, liberal arts college, and university levels. He completed a Ph.D. in plant pathology in 1995 and joined the faculty at the Air Force Academy in 1996. Bob's interests have focused primarily on faculty and curriculum development issues. Some of his activities include creating a "teaching toolbox" approach to faculty development, developing a component analysis approach to classroom observations for Front Range Community College, initiating a microteaching method for the rapid development of teaching skills, creating a top-down charter approach to curriculum development, and pioneering the "whole organism" approach to biology education. Bob traces his teaching philosophical roots to David Ausubel and his assimilation theory of meaningful learning and uses his methods of advance organizers and concept maps. EDWARD NUHFER is California State University at Channel Islands' Director of the Center for Faculty Development and the trademark owner of Boot Camp for Profs®. Ed is a geologist by training, holds several teaching awards, awards in geology from the American Institute of Professional Geologists, the 2006 Faculty Develpment Innovation Award from the Professional and Organizational Developmental Network (POD) and a 2008 Finalist award for same.. He developed interest in science education as a Shell Merit Fellow at Stanford University in the summer of 1970, and embraced faculty development as a major career interest in 1988 while on sabbatical from University of Wisconsin at Platteville. He describes himself as "a perpetual student and incurable teacher made slightly crazed and dangerous by fractals on the brain." After his sabbatical, he founded and directed the Teaching Excellence Center at UW - Platteville where he created Student Management Teams as a faculty development tool. In 1992, Ed joined CU-Denver as their first Director of Teaching Effectiveness. There he founded Boot Camp for Profs in 1993 with other faculty, started the 3-day summer Colorado Teaching with Technology Conference, and produced the one-page newsletter, "Nutshell Notes" (found in your bound notes.) Ed spent another five years at Idaho State University as Director of their Center for Teaching and Learning before being recruited to "the land of eternal spring" in Camarillo, CA, which may not quite be heaven, but it's as close as it gets for a college professional. Ed is a regular columnist for "National Teaching and Learning Forum." His favorite work week is the Boot Camp week spent with guidance of caring professors, mentors, and colleagues. Off-work, Ed can be found days on a hiking trail, a bicycle, or with friend and co-author Steve Fleisher on their vintage motorcycles along the Pacific Coast Highway. CARL PLETSCH is Associate Professor of History and past Coordinator of Instructional Technology at University of Colorado at Denver. He also teaches in the Graduate School of International Studies at the University of Denver. He returns to us this year after serving as Acting Provost at University of New Haven and spending a semester at the Australian National University. His doctorate in history is from the University of Chicago, and his undergraduate degree in history and philosophy is from Brigham Young University. He was formerly a faculty member in history at the University of North Carolina at Chapel Hill, and at Miami University in Oxford, Ohio; he has been Visiting Professor at the United States Air Force Academy on two occasions. He is author and editor of several books including Young Nietzsche, Becoming a Genius. .
JAMES RHEM founded "The National Teaching and Learning Forum" in 1990 in partnership with the ERIC Clearinghouse on Higher Education and still manages that progressive publication. Hi passion for teaching led him to create four other periodical publications for higher education, among them "The Teaching Professor." James comes to Boot Camp, not as a professor, but rather as a scholar-supporter and catalyst for improving higher education. In1996, Rhem presented a keynote address to the POD Network annual meeting on "The Teacher in the Movies." Since that overview of 12 films ranging from Goodbye, Mr. Chips to Mr. Holland's Opus, he continues to expand and refine this presentation, which is continually requested by colleges and universities. His doctorate is in 18th Century British Literature, and for 20 years he's been an arts critic for local and regional publications in the Midwest. Rhem, an accomplished photographer, has published several scholarly books on other photographers, including the American photographer, Ralph Eugene Meatyard and Aaron Siskind.